“The question I really want to answer is: How can I live a fuller life, a happier life, a more productive life?” said someone in a recent e-mail about Quantified Self. This made me think: The ideal life differs from person to person. What kind of awesome life am I moving towards? What motivates my choices and experiments, and how can I explore and learn more effectively? I have role models for this, so I can imagine what it looks like. I can look at the differences between our lives to get a better understanding of the gaps and divergences. My parents have full, happy, productive, and significant lives (although I think my mom thinks that what she’s doing isn’t as awesome or as significant as what my dad does). They make things happen. In particular, my dad touches lots of people’s lives. He has this really big scope. W- lives a full, happy, productive life. I think he focuses on doing a good job at work, doing the right thing, knowing (and applying!) all sorts of good knowledge, and being a great husband and dad. We’re probably not going to get added to any tribal epics or history books, but that’s okay. I tend to think of his scope as smaller, more local, and he’s totally awesome within it. He sometimes reaches beyond that scope to support interesting things, like Kickstarters for well-designed products. I think I live a decently full, happy, and productive life as well. Definitely yes to the happy bit; yay for high genetic set-points for happiness, good coping mechanisms, and a tremendous amount of luck. I keep some slack in my life, so I don’t feel like it’s super-full or super-productive. But people tell me that I do a lot, so maybe this is like the way my mom’s not as sure about her own contributions. I could probably do more, but this is as good a start as any. My scope tends to be similar to W-‘s, focusing on our little world. But I also have these odd outgrowths for things like Emacs, visual thinking, social business, Hacklab… These aren’t as driven as my dad’s initiatives or my friends’ startups. They’re more… curiosity-based, maybe? I enjoy exploring those playgrounds and sharing what I’m learning. I think W- is like this too – he follows his curiosity into new areas. So, if that helps me understand a little of who I am now, what does that tell me about the future Sacha I’m gradually inching towards, and what experiments can help me learn more? I imagine Awesome Sacha to be this capable, curious person with lots of skills, including practical DIY stuff. Her equanimity and optimism lets her handle whatever life throws at her (and learn from it!). Maybe she’s more involved in the community now, helping her favourite causes, but probably more from a position of lifting people up rather than going on crusades. She takes plenty of notes and shares them, helping other people learn faster and see the connections among different ideas. If that’s a potentially interesting Future Sacha I could become, what can I track to measure my progress along the way, and what kinds of experiments could stretch me a little bit more towards that? I can pick up and practise more skills: Cooking, sewing, electronics, DIY repair, etc. I can track this through journal entries, blog posts, comfort level, and decisions to do things myself versus asking or paying someone else to do things. For example, I now feel comfortable cooking, and I remember feeling a lot more uncertain about it before. I feel moderately okay about repairing small appliances and doing simple woodworking, but could use more practice. I have hardly any experience with plumbing or tiling. I can observe more, and write about more of what I’m learning: The little hiccups and challenges in my life feel so much smaller than the ones that other people go through, and I usually don’t write about them. Keeping a journal (even for the small stuff) might result in interesting reading later on, though. I already bounce back pretty quickly. It might be interesting to see how I respond to larger and larger changes, though, so deliberately taking on more commitments and more risks can help me develop this part of my life. I can help out more. I think it’s okay even if I don’t try to maximize utility on this for now. I’ll start with the things that resonate with me. It’s easy enough to track hours and money for this; maybe later I can add stories too. Most of my little experiments come from looking at ideas that are close by and saying, “Hmm, that’s interesting. Maybe I can explore that.” Sometimes it helps to look a little further ahead–to sketch out an ideal life, or even just a slightly-better-than-this life–and to plan little steps forward, going roughly in the right direction. Some ideals fit you better than others do, and some ideals just won’t resonate with you. For example, I currently don’t wish to be a highly-paid jetsetting public speaker. Thinking about this helps you figure out what kind of future you might want, and maybe figure out a few ways to try it on for size and track your progress as you grow into it. What kind of person would Awesome You be like, and how can you inch a little closer? Do you talk about what you do and how you do it? 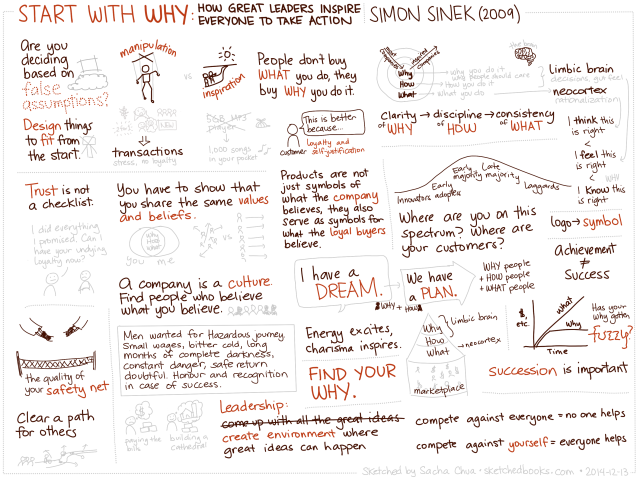 Or do you start with why you do the things you do and why this matters? 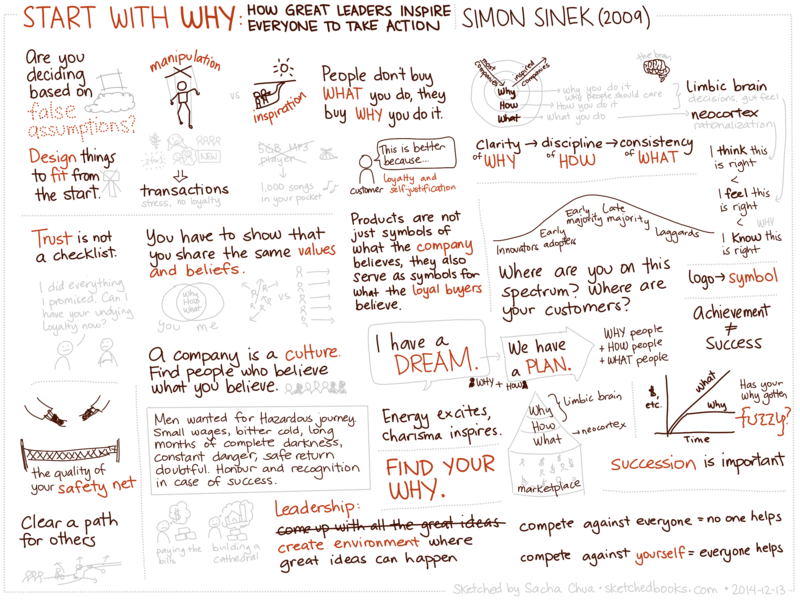 In Start With Why (2009), Simon Sinek writes about how great companies have a clear purpose and identity that inspires employees and earns customer loyalty. Here’s my sketch of the key points from the book so that they’re easier to review or share. Click on the image to view or download a high-resolution version that you can print. My selfish reason for visual thinking is because I want to be able to learn, think, and remember more effectively, so that I can live a better life. 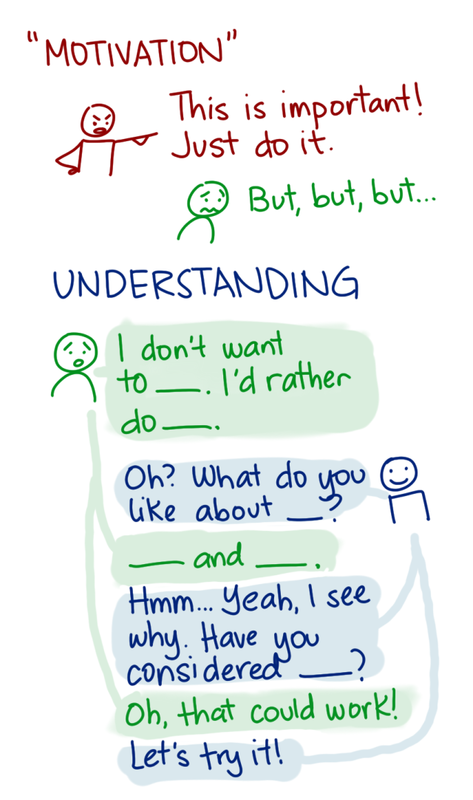 My altruistic reason for sharing visual thinking is because there are lots of people who enjoy learning from drawings more than text or audio or video. I want to share how I’m learning, but more than that, I want to inspire people to take these techniques and use them for their own. From the resources I share, people can see that you don’t need to draw particularly well in order to use doodling as a way to explore the world or untangle your thoughts. My selfish reason for experimenting (lifestyle, semi-retirement, business, ideas, etc.) is so that I can figure out what works well for me. My altruistic reason for sharing my experiments is to encourage other people to question their assumptions, look for ways to test their hypotheses, and gradually shape a life that fits them well. Come to think of it, it’s similar to why I like helping people personalize Emacs. If I can help people explore the possibilities in their life, we might come across interesting ideas along the way. What are your whys? Why do you do what you do, and why does that matter? Get “Start With Why” on Amazon (affiliate link) or from your favourite book source. Like this sketch? Check out http://sketchedbooks.com/ for more. Feel free to share – it’s under the Creative Commons Attribution License, like the rest of my blog.